Browse: Home / Why British Haste on Plane Bomb Theory? Within days of the Metrojet A321 breaking up in midair, Britain’s Prime Minister David Cameron said it was “more than likely” that a bomb secreted on to the plane was the cause of the disaster, which took the lives of all 224 people onboard. Cameron’s Foreign Secretary, Philip Hammond, added that British intelligence points to an explosive device being a “significant possibility”. No details were provided for why the London government was invoking this probability. From that assessment, British commercial flights from Egypt’s Sharm El Sheik were promptly cancelled this week. Like Russia, Egypt has also responded with annoyance at the British rush to speculate. American officials appear to be following the British lead on the bomb theory. Initially, James Clapper, the US national intelligence director, told media that it was unlikely that a terrorist cause was to blame. Clapper didn’t rule it out completely, and his focus in that unlikely event was on the outside possibility that an Al Qaeda-linked group could have possessed a surface-to-air missile capable of hitting a plane at high altitude. However, notably, following the British bomb assessment, the Americans have now taken up that idea. President Obama told American media on Thursday — five days after the disaster — that he believes there is a “serious possibility” that a bomb took down the Russian airliner. The day before Obama spoke, various US media outlets were also quoting unnamed officials as proffering the same speculation about a terrorist bomb plot. Russia has reacted angrily to the high-level comments from Britain and the United States. Quite rightly, Moscow has said that it is inappropriate to speculate at such an early stage in the crash investigation. 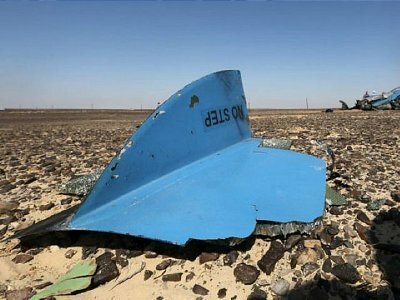 A team of investigators are on the ground in the Sinai Peninsula where the airliner fuselage came down, still examining the aircraft remains. Moreover, when Britain, followed by the US, announced its terror concerns the examination of the flight data recorders (black boxes) was only just underway. It may take weeks before forensic analysis reveals if there are any chemical residues on the plane parts that would indicate if explosive device did indeed cause the aircraft to blow up. Other possibilities are that the plane broke up due to a mechanical rupture, or an engine combusted from its own fuel. At this stage a calm circumspect, open mind is warranted. But not, it seems, for the British. Later this week, Britain’s state broadcaster, the BBC, added more details to the bomb theory. Citing unnamed intelligence officials, it says that the Russian plane “had a bomb in the [luggage] hold”. The Metrojet flight appears to have broken up some 23 minutes after take-off just after it reached its cruising altitude of 30,000 feet. The BBC reports that 10 months ago British intelligence officials had warned the Egyptian authorities to tighten up security at Sharm El Sheikh airport. A follow-up inspection found that the Egyptians had complied with the security tightening measures, although the British were, according to the BBC, still concerned that procedures may become lax again. British holidaymakers wait at Sharm el-Sheikh after flights suspended. The speed with which Britain suspended flights suggested Britons could be targeted too. Thereby helping to divert attention from the real culprits? Sharm El Sheikh is believed to be a hub for British intelligence across the Middle East. They obviously know the airport well. The question is: why are the British, and the Americans, making such high-profile claims about terrorist involvement in the Russian airliner crash? The very public comments by heads of government have the connotation of an unseemly interest in politicising the incident. If Britain had sensitive intelligence on a terrorist input then why doesn’t it share it discreetly with the Russian government? The British could also have just suspended commercial flight services with a low-key statement on security precautions. But the announcement this week to cancel flights was made in the context of Britain’s “terrorist bomb theory” — as if to authenticate that claim as valid. In this regard, there is an obscene haste to turn a tragedy into a political football, as with the downing of the Malaysian flight over Ukraine in July 2014, when again the British and the Americans leapt to make premature judgements over the cause of the crash, and on that occasion to impute Russia or “Russian-backed rebels” in east Ukraine. So what is to be gained by London and Washington attributing the Russian airliner deaths to terrorism? It is not hard to imagine that both would like to see Russian President Vladimir Putin incurring a political backlash from his nation over what is Russia’s worst-ever air crash. The Al Qaeda-affiliate in Sinai claiming to have taken the plane down has said that the alleged attack was in revenge for Russia’s military intervention in Syria, which has wiped out hundreds of Islamic State and other so-called jihadists. Russia’s military intervention in Syria has so far proven to be a political success for Vladimir Putin. Russia has gained much kudos internationally for its decisive actions to eradicate vile terror groups and for helping to relieve the Syrian nation from a four-year war. Moscow has also taken the lead with respect to organising political talks between the government of Bashar al-Assad and constitutional opposition parties. Furthermore, Putin’s military foray in Syria has discommoded Washington and London in their covert attempts at regime change in that country. The Western-backed covert war relying on sundry mercenary terror networks — mislabeled as “moderate rebels” in the Western media — has been brilliantly exposed and is being thwarted by Russia. Western vexation with Putin’s masterstroke in Syria is palpable. A month after Putin’s stunning success in Syria, a Russian civilian passenger plane goes down over Egypt. A ragtag terror group claims responsibility in killing over 200 Russian civilians in revenge for Putin’s anti-terror operations in Syria. Britain and America then move at the highest level of government — how unusual is that?— to back up the terrorist claims of a “spectacular” blow against Russia. The political motivation of undermining Putin seems clear — albeit despicably base given the loss of civilian life. Cameron and Obama are evidently being fed intelligence assessments of a bomb being stowed in the airplane’s hold by terrorists. But here is a big one. The confidence by which these assessments of terror methodology are being made raises an even more troubling, darker question: was it really terrorists, or was it British MI6 agents palming the deed off as terrorists?